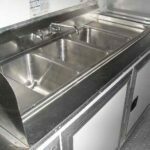 This Mobile Kitchen Trailer 66 Ft Design has three-compartment sinks with drain boards along with six-interior counter and handwashing sink. 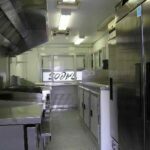 It is equipped with 100 A panel box, 2-64×40 concession doors and serving windows, 6-4ft double fluorescent lights, a light switch, 20A dedicated outlets and a roof vent. 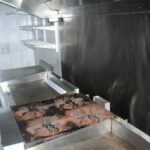 It also consists of a fresh water tank, hot water tank and waste water tank. 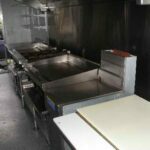 For your food preparation needs, it is equipped with four propane tanks with brackets, 2-36 flat-top grills, 1-40 deep fat fryer, 1-6 burner oven, 3-well steam tables, 2-36 Stainless Steel equipment tables. 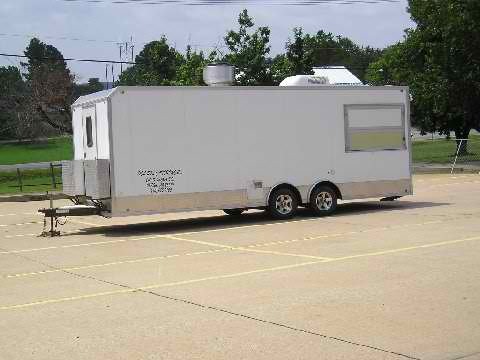 A 19 cubic feet stainless steel refrigerator is also available for food storage. 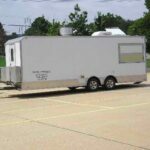 For your safety, we have installed our trailers with exhaust hood with slash guard and a wall-mounted fire extinguisher.